This is the errata page of the Practical Php Testing ebook, where typos and other errors will be listed and corrected. This page is linked to in the to Errata section of the book, to provide updates if errors are found without releasing different and confusing versions of the book. 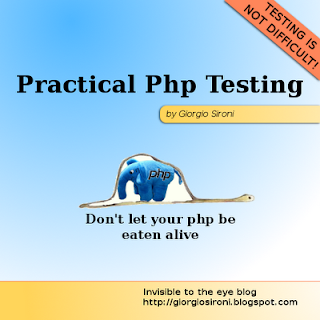 Practical Php Testing will be published on December 2, 2009. Hello,i have a copy of this book and i just go through this section.Most of Errors and their solutions and Typos are described there.Thank you.